Beryl is researching the waterways in the district – some of her research is presented below. 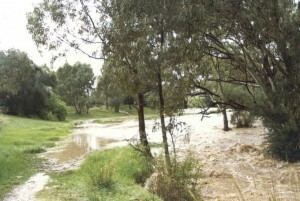 Gould Creek rises to the east of One Tree Hill and is the northern boundary of the Tea Tree Gully Council area. It has several fresh water springs along its course and is the water catchment of the Little Para Dam. It meets up with the Little Para, which rises at Paracombe and is the main water catchment for the Dam. This junction was at the centre of a property known as Cumberland Farm, owned by Reuben Richardson (my great grandfather). When I was a child, the old homestead was still there, although not fit for habitation. There were many old fruit trees still surviving in those days, especially a large mulberry tree growing at the junction of the streams and covering an area the size of a large house block. Over the years, it had collapsed at the main trunk, but still produced lovely fruit. Many a Sunday afternoon and a two mile walk along the Little Para River was rewarded with a feast of berries when in season and of course, a bucket full to take home. All this is now under the Little Para Dam, but I still have many happy memories of those days. 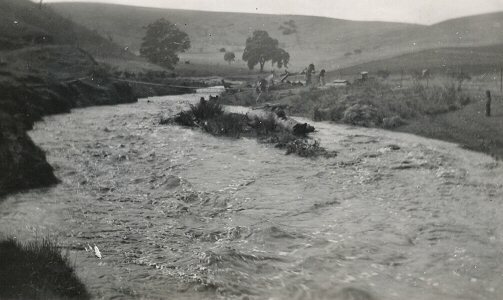 Cobbler Creek rises in the hills west of Seaview Road, near the junction of Range Road North and travels through farming land and the old township of Golden Grove. It is believed its name was derived from a Cobbler named Peddler who lived near the creek on section 2109 Hundred of Yatala. Slate Creek joins Cobbler Creek near the Golden Way . This creek rises west of Seaview Road , closer to One Tree Hill road traveling past the old Golden Grove School and Golden Grove House. Many wells were dug along these waterways usually near the homesteads, supplying them with good water. Underground tanks collected rainwater from the farmhouses and sheds. Reserves along Cobbler Creek retain some of the natural growth and pleasant walking and picnic areas. Continuing down to Salisbury a lot of Cobbler Creek disappears in new housing development and emerges in an open drain and finally continues through wet-lands and into Dry Creek and out to the Barker inlet. 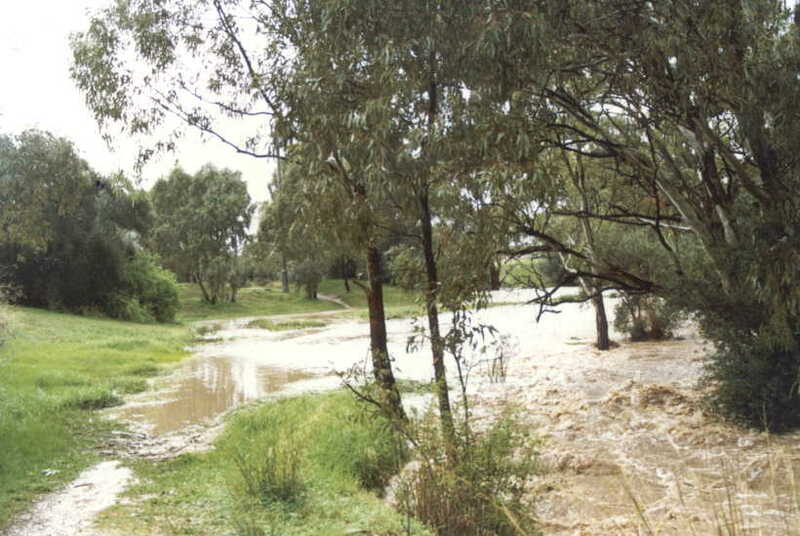 Cobbler Creek was proclaimed a park in 1989.It is a 288hectare park some 19 kilometers north of Adelaide at Golden Grove. The park is bound by Bridge Road, Smith Road, and Green Valley Drive, with The Grove Way dissecting the centre of the park. Cobbler Creek was so called apparently because a shoemaker or cobbler carried on his business beside the creek that runs from the area that was called ‘Little Para’ down into Salisbury. There are two names that fit the criteria –William Pedler 111 and Edward Barnett. Although it was assumed that Edward Barnett was the Cobbler in question, it appears that this is not the case, as the area was referred to as Cobbler Creek in the Adelaide Directory of 1855 and Edward Barnett did not move into the ‘Little Para’ area until late 1858 – early 1859. Dry Creek rises in the Tea Tree Gully Range , near Glenara Vineyard collecting many tributaries on its way through Yatala Vale, passing through Elder Green to Wynn Vale dam. Following in close proximity to Golden Grove road, passing through properties of early settlers. Several large tributaries flow through Fairview Park, Banksia Park, Redwood park and Ridgehaven and meet Dry Creek near Drumminor on Golden Grove road, through Modbury North and Modbury where a tributary from Tea Tree Gully and another from Anstey Hill area joins near McIntire and North East roads. 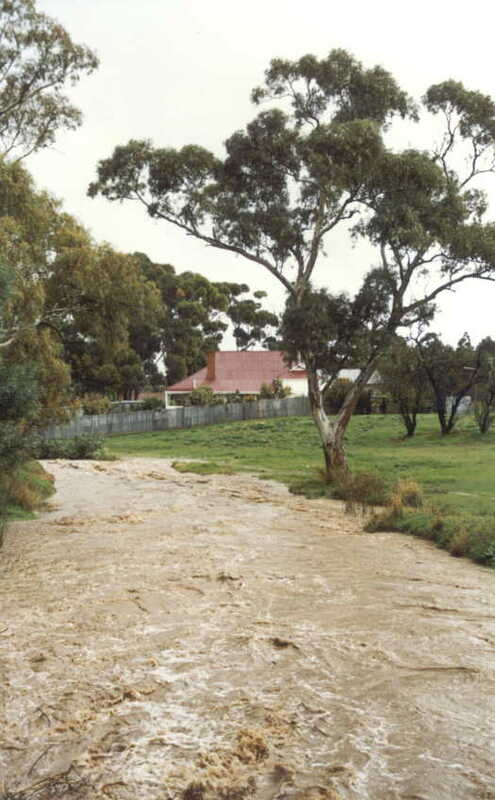 Another tributary comes from Hope Valley , Highbury area and joins Dry Creek near Kelly road. These tributaries collect a great amount of water and by the time Dry Creek reaches Grand Junction road, it is here it takes a sharp turn and one can see where the force of the water has eroded the banks. 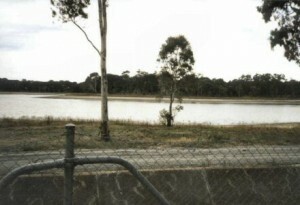 Dry Creek travels out of the Tea Tree Gully council area through Valley View, Walkley Heights , Pooraka, Mawson Lakes through the wetlands and finally out to sea at the Barker Inlet. 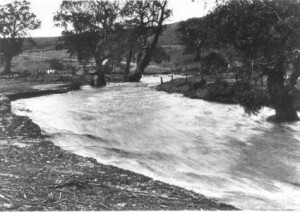 The River Torrens is the Southern Boundary of the City of Tea Tree Gully Council A bridge made of wood was built on Lower North East Road at Paradise in 1857 to span the river, in 1880 this was replaced by an iron bridge and the last replacement was a concrete one in 1957. A Ford (now closed) and a swing bridge were located on Reeds Road. Many orchards and market gardens occupied the fertile flats along the river, sadly they have gone now, making way for housing. Several of the old homesteads still remain and reserve areas’ help to keep some of the natural look of the river. 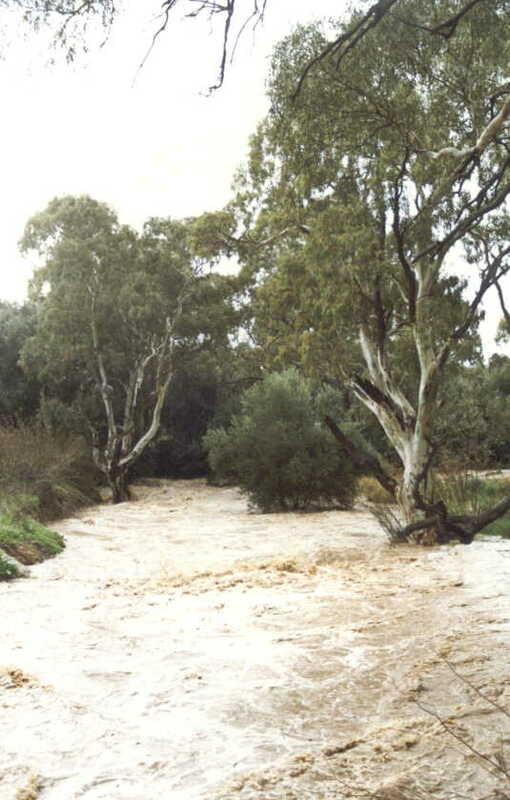 The River Torrens is the Southern Boundary of the City of Tea Tree Gully Council. Gill Shields Dam was on Tolley road near the Tea Tree Gully Council works depot at St Agnes. Dickie Balds Dam was off Baronia Avenue , Hope Valley . 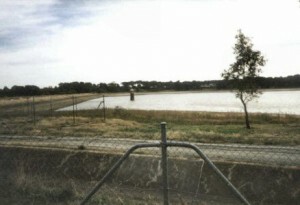 Hope Valley Reservoir was built in 1872 with a capacity at that time of 3470ml. With a major upgrade on the reservoir’s bank, the capacity will increase. 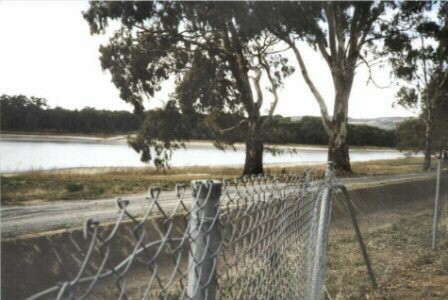 Water was piped from Anstey Hill until the remedial work was finished, at an estimated cost of $8.8 million. The property known as ‘Baymore’ on the North East Road at Modbury, had a well still in use until 1965. Depth of well was 19ft with a water level of 16ft and was mostly used for stock and irrigation. Mr. L. Johnson had a property bounded by North East and Wright Roads and Dry Creek. The well was 175 feet. After the earthquake in 1954 water increased but became very salty. Mr. Johnson operated mining using the well water to wash the sand and metal.Several Horse Troughs were in the area at Tea Tree Gully Hotel, Modbury Hotel, North East Road and Golden Grove Road (old junction). A government well was situated on Golden Grove Road , near the junction of Hancock Road and adjacent to a well on the property owned by Mr. Carraill. At this point, water was obtained for council work, private needs as well as a vital commodity in the fire- fighting season. One morning at the beginning of a workday early in March 1995, the government well came to an end filled in because it was in the way of progress. It hadn’t been used and was practically dry for many years; since a clay pit went deep and drained away that particular stream those wells were on. The water was excellent, suitable for any use. 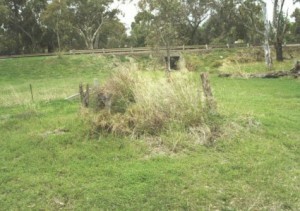 For many years the well was used by many locals and near neighbours during summer. A lot of properties in Golden Grove and Yatala Vale didn’t have permanent water, so once tanks and dams ran dry water had to be carted from the ‘Well’. Some even drove their cows from Yatala Vale to drink at the trough beside the well, after drawing the water with a bucket on a rope. It was quite a long job to draw enough water to fill a drum or tanks as the bucket would be a kerosene tin, with a handle on the top holding 4 gallons. The old kero tin was made much use of around farms, carrying water, grapes, chaff and many other uses. Quite often the handle would out live many buckets, because the tin would rust but the handle would last much longer. I don’t know when the well was dug, must have been very early in the beginning years. Must have been dug expertly as I cannot remember it being repaired in my time. My Auntie Clarice cannot remember when it was dug. Farmers and dairy men came from quite a long way to get water, when it came to putting the roof on the stacks of hay, they would come for water to damp the straw for thatching the roof. It was a much harder and longer job drawing water if the water had been used several times as the water level went down it took longer to draw up the bucket. Although the well could get well down at the end of a hot day after much use, by next morning it would be full again. In those days a good water supply was very important and the farm animals were limited to the water and the summers, only a few had wells of their own and not all the water was good.